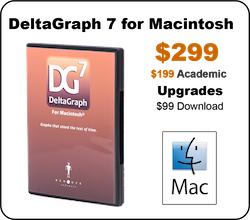 DeltaGraph 7.1.2, with a fix for a Mac OS High Sierra crasher, is now available on our downloads page More Info…. Go here for more info on the QuickTime™ for Windows issue. The original and still the best! DeltaGraph provides unparalleled chart selection, data analysis and graph customization capabilities. Work smarter with custom chart template libraries, MS Office™ interoperability, and support for spot color matching. DeltaGraph is the number one choice for publication quality charts.